I love the MOFO challenges where the geniuses behind MOFO give you an ingredient or two, or four and you have to come up with a new recipe. The first MOFO challenge this year was The Iron Chef Challenge and the ingredient was beetroot. I did not participate but you may see the wonderful entries here. With the Iron Chef there are no winners or losers just participants sharing ideas. 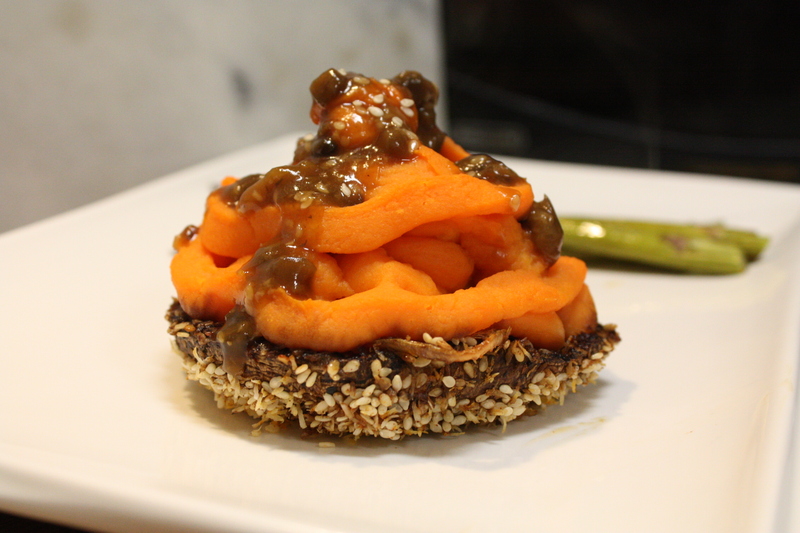 The second challenge was called Chopped/Vegan hosted by the one and only Isa Chandra who challenged participants to come up with a brunch item with the ingredients: popcorn, butternut squash, apricot preserves and rosemary. I did participate in this challenge where there were actually prizes and realized why I am simply a home hobby cook playing with the pros. You need to check out the winners here. This week is another Iron Chef and the ingredients are potatoes (sweet are okay) and sesame seeds. It was announced yesterday and about 2 o’clock this morning I decided that I wasn’t going to create anything because I was having a creator’s block. I must have been dreaming about it because I woke up with an idea and it came together quite well. Delicious in fact! Cut stems off mushrooms and set aside for gravy. With a small spoon scoop out the ribs of the mushrooms. In a bowl mix together tamari, coconut syrup and garlic. Put mushroom caps and onions in a seal able container or bag and pour tamari mix over them. Allow to marinade for a minimum of 30 minutes flipping occasionally to make sure everything is well covered. Make your sweet potatoes (recipe below) while mushrooms are marinating so they have time to cool. On a plate mix sesame seeds, coconut, pepper, and paprika. Press mushroom tops into sesame mix and place ribs side down onto cookie sheet. Coat the onion with sesame mix as well and place on cookie sheet. Reserve marinade (and some smaller onion pieces for gravy-recipe below.) Bake mushroom and onions for 10 minutes. Start gravy when you put mushrooms in oven. Remove from oven and set aside. Reduce oven temp to 350 degrees. Boil sweet potatoes and pineapple with salt until they are tender when poked with a fork. Drain reserve 1/4 cup water. Add coconut oil. Mash with a potato masher adding reserved water as needed. For smoother potatoes use a food processor or immersion blender. In large pan saute mushrooms and garlic in olive oil over medium heat. After five minutes add pineapple. Cook five more minutes then add marinade, sesame mix and 1 cup water. Let simmer for 15 minutes. In a cup mix cornstarch and 1/4 cup cold water. Slowly stir cornstarch mixture into gravy. Bring to boil for one minute stirring constantly, reduce to low until ready to serve. Cover asparagus with oil and tamari. I threw mine in a sealed container and shook. Bake for 15-17 minutes depending on how crispy you want the tops. Serve. Gallery | This entry was posted in An Ode to Vegan Bloggers MOFO 2012, Gluten Free, Main Course. Bookmark the permalink. That’s beautiful! Way to rise to the challenge! You must have had a pretty great dream, because this looks like stuff that dreams are made of. Thanks Kim! I’m pretty sure I eat in my dreams constantly! This looks delicious! I love the idea of pineapple in gravy. Thanks! I was surprised at how good it came out. Ohhhhhhh wow. Totally all my comfort flavours!!! Not my normal flavors but I loved it!